The objective of this programme is to prepare an engineer who is able to innovate both in the industrial environment and in fundamental research. The graduates will have a broad cultural and scientific foundation on solid-state and modern physics, and its state-of-the-art applications in photonics and nanoelectronics. The Semiconductor Nanotechnology track, whose second year will be held at the Como campus, will comprise experimental laboratory modules set in the active research environment of the L-NESS Inter-university centre. These modules will directly introduce the students to hands-on semiconductor nanostructure characterization. 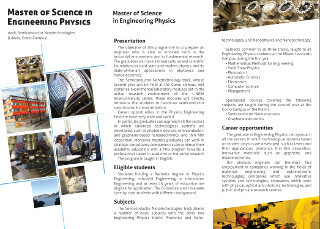 Career opportunities in the Physics Engineering field are extremely wide and varied. In particular, graduates can approach all the sectors in which advanced technological systems are developed, such as photonic devices, semiconductor- and graphene-based nanoelectronics, and thin film deposition. Moreover, masters graduates can work in strategic consultancy companies or can continue their academic education with a PhD program towards a professional career in academic or industrial research. 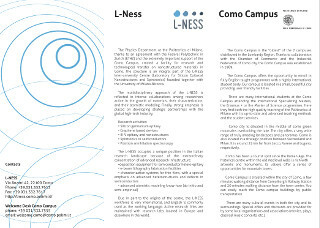 L-NESS generally accepts students for both PhD and Masters theses: for details contact the leader of the group which interests you, and the websites of fisica and ingegneria fisica of the Polimi. There are no currently open PhD positions.